Central to the Alexander Technique is the balancing of the head on the top of the spine. Not for aesthetic purposes, although a well-balanced head looks beautiful, but because it requires a lot less muscular effort. The weight of the head is in the region of 4.5–5.5 kgs in an adult. Lift up a 5 litres water bottle and you have will an approximate feel of the weight you are carrying on your spine during the day. Various studies have calculated the extra effort involved if the head (and frequently the neck as well) is forward from your body’s line of gravity. 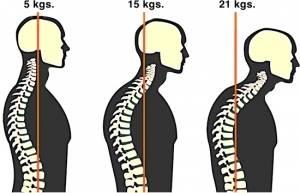 One study suggests that even just 15 degrees protruding head and neck is the equivalent of carrying 15 kgs of weight instead of 5 kgs. This means back musculature have to work a lot more and the increased pressure on the chest may well interfere with the breathing. With the Alexander Technique you learn how to let go of unnecessary tension so that the muscles of the spine and back can expand and lengthen, thereby allowing the head to balance freely on the top of the spine, with minimum of effort.